When a double-agent's allegiance begins to waver, the galaxy finds itself in a precarious position. Humanity is struggling to survive against the Krill onslaught. Ian Recker, a decorated pilot, goes undercover to investigate the Krill's secrets, but finds himself trapped in a moral dilemma. 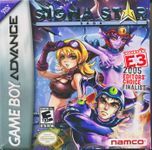 The first RPG on the GameBoy Advance to combine a deep storyline and well-developed characters with a space-shooter battle engine.